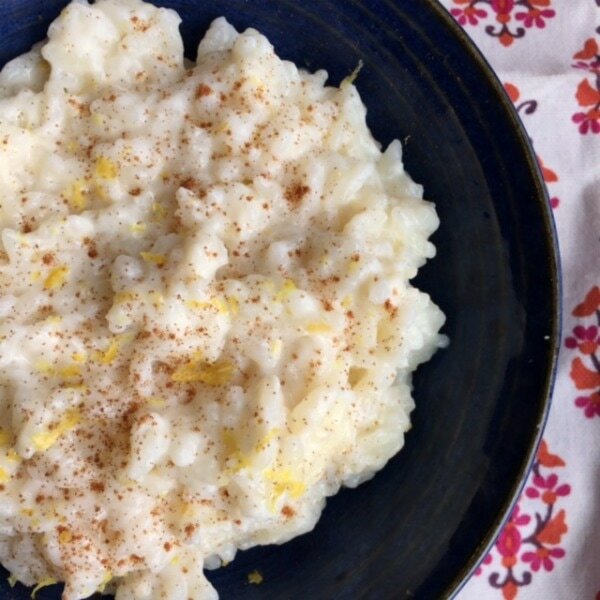 This creamy rice pudding is lower in sugar than traditional desserts. But, the addition of cinnamon and vanilla give it a natural sweetness you will love. Plus, pudding is a great way to get calcium and vitamin D! If you are looking for a heartier option, try Brown Rice Pudding which has a bit more filling fiber. Measure out milk and reserve 1 cup for later. Bring 2 ½ cups milk and rice to a boil in a heavy bottomed skillet over high heat, stirring occasionally. Reduce heat to medium and continue boiling for about 5-6 min until mixture begins to thicken, stirring occasionally. Stir in additional 1 cup milk, cinnamon stick, sugar, and lemon zest. Increase heat to medium-high. Boil 4-5 minutes until creamy. Let sit for about 30 minutes to continue thickening. Remove cinnamon stick before serving, and sprinkle with ground cinnamon.